Hi friends! I'm currently in Turkey on vacation with my mom, but had this post lined up for you folks to read while I was gone because The Content Machine is scary and powerful but also because I was really excited about sharing this ube babka with y'all. Be sure to follow along on Instagram for my Turkey-related stories and photos; we're currently in Cappadocia for some hiking and hot air balloon riding, and I am beyond stoked! I made my first babka almost four years ago in 2014, before it really "became a thing"; after seeing Deb's version, I was inspired to give it a shot. My first babka, which is still alive on vintage Hummingbird High, interwove chocolate and pumpkin together in celebration of autumn and cookbooks (lol). Although I was very proud of it at the time, in retrospect, the loaf looks small and underproofed in the photos. I had no idea though – I just thought that maybe babka wasn't really my thing and that other desserts were more my jam. This was confirmed when, a year later, I moved to San Francisco and had the driest and blandest babka slice from Wise Sons Jewish Delicatessen. 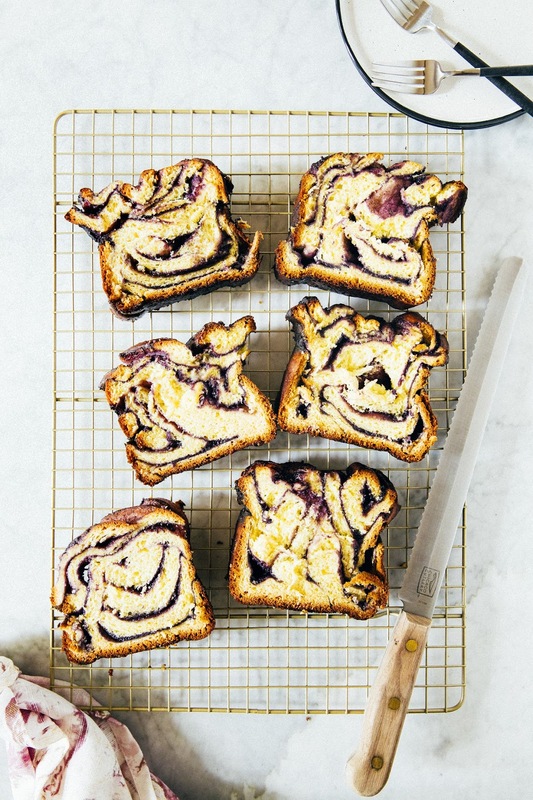 It was only recently, after moving to New York, that I realized the full potential of the babka. 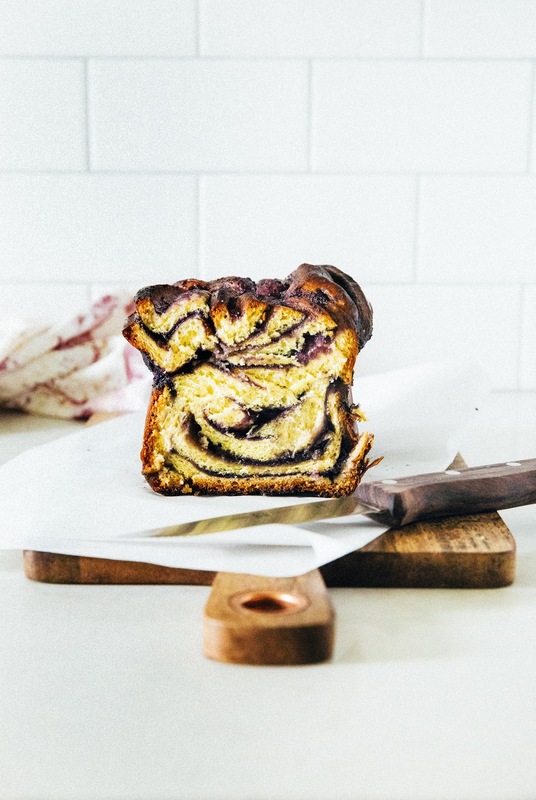 Molly tipped me off to Breads Bakery, maker of New York City's best babka and the bakery often credited with bringing the babka as we know it today to the mainstream. Then there was the babka french toast at Russ & Daughters and the chocolate glazed babka at Sadelle's. Heck, even the pre-wrapped and shelf-stable packages from Green's Babka blew anything I'd previously made or had out of the water. 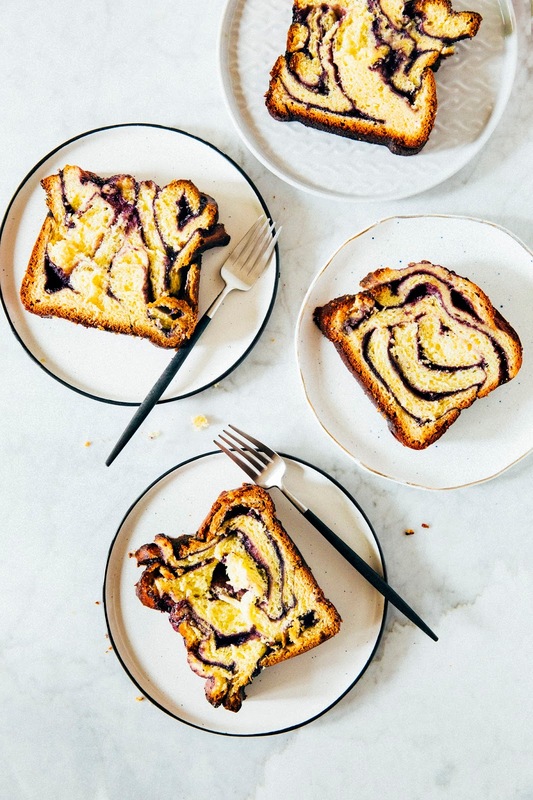 It was babka like I'd never had it before: sky high in height with picturesque swirls weaving throughout the bread... and the crumb — oh, the crumb! Light, buttery, and fluffy, but made fudgy and dense from chocolate and simple syrup. 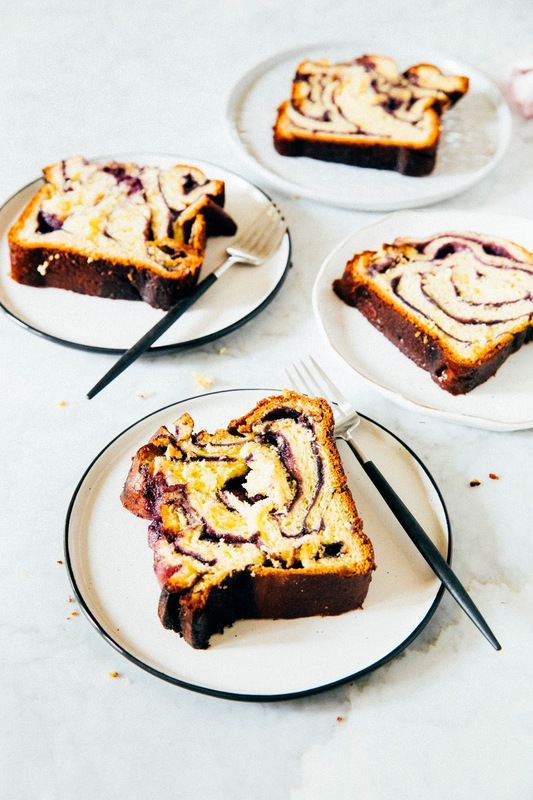 Living in New York, there was never a reason to make babka at home. My office was a stone's throw away from Breads, and I could easily go to any of the places I mentioned above to pick up a loaf. But Portland is a different story. As far as I know, there is only one place in the city that makes it, and I am suspicious of it because their bagels are very much lacking. Portland does a lot of food things well, but bombs others completely: bagels, in particular, are a nut that Portlanders have yet to crack. So, I decided to roll up my sleeves and try it again at home. I used the same base recipe as I did when I first attempted homemade babka in 2014: Yotam Ottolenghi's chocolate krantz cake recipe in Jerusalem. This time around, the babka was magical. You can see from the photos yourself — there's no sad and dense flatness here. The loaf was almost bursting out of the pan! And the swirls, those swirls. They're purple! Inspired by the success of my ube cinnamon rolls, I decided to make this babka with ube filling as opposed to the traditional chocolate or cinnamon fillings of babka. Ube, you may recall, is a purple yam akin to a sweet potato in flavor (but milder and more rooty, if that's a real world) and is frequently used in Filipino and other South East Asian desserts. It was delicious. I'm not going to lie — babka is a time-consuming venture, and is tricky for novice bakers to nail (I mean, you saw my sad, flat loaf from a few years ago). So be sure to read the Baker's Notes below beforehand to learn where I *think* I went wrong the first time around. 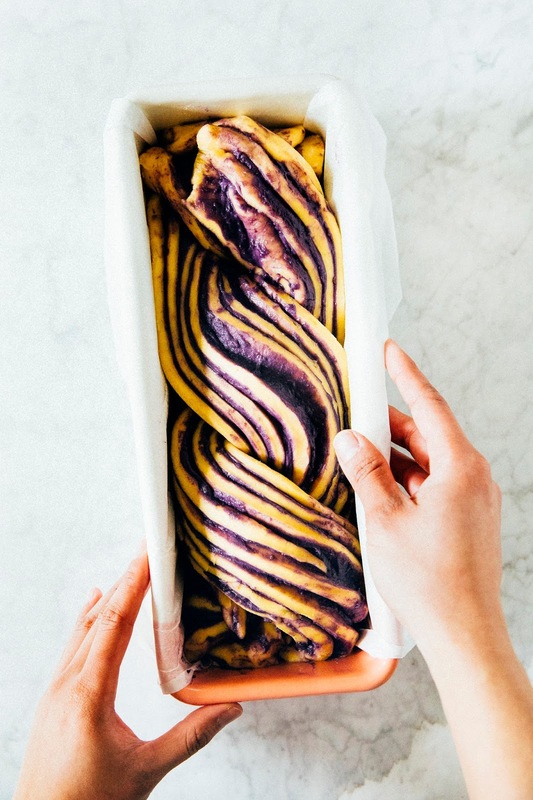 It's also worth investing in a copy of Jerusalem to see step-by-step photos of how to actually braid the babka; you can also check out my babka post from 2014, as well as my Instagram profile on your phone under the Instagram Story "Ube Babka" — both will have some photos on how to slice, roll, and braid the dough appropriately. God speed, and enjoy! I made a major couple of changes to Yotam Ottolenghi's original recipe. First, his recipe instructs you to divide the dough to make two 9 x 5-inch loaves. But dividing the dough means having to fuss and mess with two loaves as opposed to one, and I am wayyyy too lazy for that. So instead, I baked the loaf into a large 13 x 4-inch pullman loaf pan — the pretty kind I used is no longer available, but you can easily find more utilitarian ones online (this one or this one looks like it'll do the trick). The second major change I made was to add an egg yolk to the recipe. Yotam's original recipe instructs you to use extra-large eggs, which I never have on hand because literally 90% of all recipes instruct you to use large ones instead. Since I didn't want to go out and buy extra-large eggs, I just used regular large eggs and added an egg yolk to account for any lost moisture and protein. It worked! The extra egg yolk also gave the crumb a subtle pale yellow color that complimented the purple of the ube wonderfully. Speaking of ube, you'll need two sources of ube for this recipe: ube halaya jam and ube extract. Ube halaya jam is available online, and can usually be found in the Filipino/Hawaiian aisles of an Asian supermarket (Portlanders — I bought the Monika brand at Fubonn, which is also available at Uwajimaya). Ube extract is tricker to source in real life, but can easily be purchased online (I used the McCormick brand). Use any leftovers to go on an ube baked goods bender and make these ube cinnamon rolls and ube crinkle cookies! Alright, let's talk science for a hot second. One of the reasons why I think my first babka didn't rise all that well is because I used active dry yeast as opposed to instant yeast. If you're an intermediate/advanced baker, you'll probably know what I'm about to tell you, so you can skip this part. But beginners, listen up: it's important that you follow the recipe and use the exact type of yeast that it's called for. Different kinds of yeast are activated in different ways and at different temperatures. You can't substitute in one for another without changing the way you work with the yeast too. Active dry yeast is usually activated by soaking it in some warm water, whereas instant yeast can be mixed in with ingredients directly. 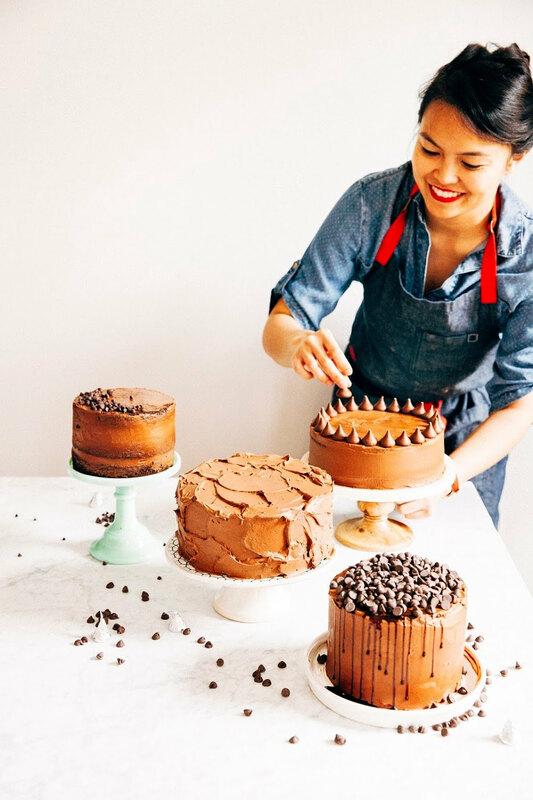 Check out this article from The Kitchn for a quick primer on the differences between the two. Be sure to use instant yeast for this recipe. Similarly, it's important to learn how to read the dough — the times for proofing in the recipe are estimates and assume that you're working in a room that's between 70 to 75 (F) degrees warm. If your kitchen is colder than that, like mine frequently is, your bread will rise more slowly and will need to proof for longer than what is stated in the recipe. Baking underproof loaves will lead to squat, dense ones like my sad babka from 2014, so go with visual cues as opposed to recipe times. The first proofing will have the dough double by half, the second proofing will have the dough double by 10 to 20%. I know that it can be time consuming to let breads proof, so there are some tricks to get around this — I always mix my dough in the evenings and stick it in the fridge to proof slowly overnight so that it's ready to go first thing the next morning. 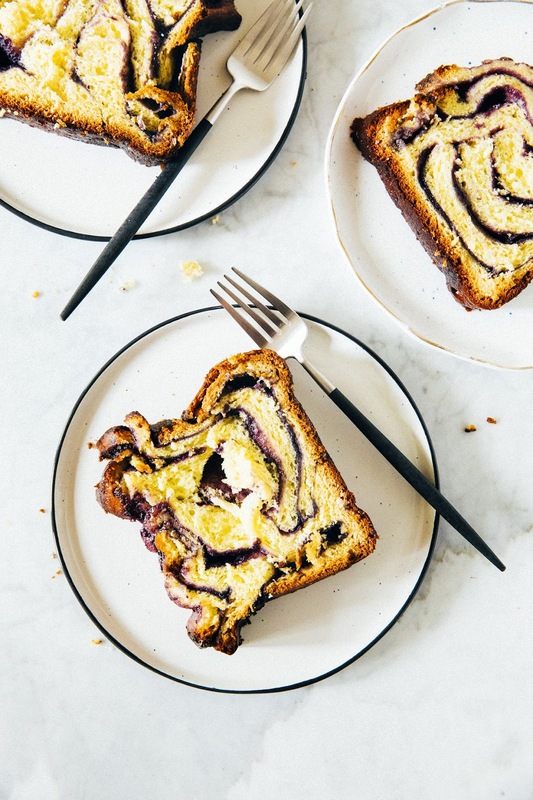 If you do this for this babka, you'll still need to wait for the babka to rise after braiding again, but it definitely cuts down your waiting time from potentially four hours to just two max. First, make the dough. 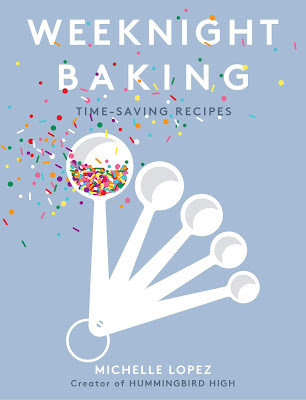 In the bowl of a freestanding electric mixer fitted with a dough hook, combine 4 1/4 cups all-purpose flour, 1/2 cup granulated sugar, 2 teaspoons instant yeast, and 1/4 teaspoon kosher salt. Whisk to combine and nestle into the electric mixer. Turn the mixer on to its lowest speed and add 3 large eggs and 1 large egg yolk one at a time, only adding the next egg when the previous egg is fully incorporated. With the mixer still on the lowest setting, stream in 1/2 cup warm water. Once all the water has been added, increase the mixer speed to medium and mix until dough forms, around 3 minutes. Add 2/3 cup cubed unsalted butter a few cubes at a time, adding butter only when the previous cubes have fully incorporated into the dough. Once all the butter has been added, use a rubber spatula to scrape down the sides of the bowl to incorporate any stray ingredients. Turn the mixer back to medium speed and knead for 10 minutes, until the dough is completely smooth, elastic and shiny. Once the dough is as described, transfer the dough to a lightly greased bowl. Cover with plastic wrap and let rise at room temperature (between 70 to 80 degrees) for at least 2 hours, until the dough has doubled in size. While the dough is rising, make the ube filling and prepare your pans. In a medium bowl, combine 1/3 cup ube halaya jam, 1/3 cup crème fraîche, 1/3 cup granulated sugar, 2 teaspoons ube extract, and a pinch of kosher salt. Set aside. Prepare a 13 x 4-inch pullman loaf pan by using a 12 x 16-inch piece of parchment paper to line the bottom of the pan and create a "sling" with overhanging edges on the long sides of the pan. In order to achieve this, you'll need to align the center of the parchment paper lengthwise over the pan, and use your hands to press the center of the paper into the bottom edges of the pan. Run a butter knife over the parchment paper across the bottom edges of the pan to get the paper to adhere and mold to the pan's shape. This is important! You'll need this for later. It might even be beneficial to put some heavy objects in the pan (like clean cutlery) to get the parchment paper to keep its shape. Once the dough has doubled in size, turn the dough out onto a lightly floured surface. Use a rolling pin to punch down the dough and roll out to a rectangle about 20 x 13-inches wide. Use a bench scraper to push the edges into the dough mass, creating smooth, even sides for the slab of dough. Use an offset spatula and spread the ube filling (from the 3rd step) evenly across the dough, making sure to spread filling all the way up to the edges of the dough. Once all the filling has been used, it's time to roll and braid the babka. Use both hands to roll the rectangle like a roulade, starting from one of the shorter 13-inch side of the rectangle. You'll end up with a thick log of dough that is 13-inches long and looks and feels a little bit like a massive burrito. Transfer the dough to a large chopping board and use a sharp, serrated knife to slice it in half lengthwise. You are essentially dividing the log into two long even halves, with the layers of dough and filling from the log visible along the length of both halves. Scoot both halves to the side of the chopping board to clear a work space. Take the parchment paper sling that's lining the pullman loaf pan and place it on the center of the chopping board. Spray the parchment paper with a light layer of cooking spray. Transfer both dough log halves to the center of the parchment paper. If you've done the 3rd step properly, the parchment paper should still retain the shape of the loaf pan — you'll need to put the logs in the portion of the parchment paper that fits to the the bottom of the loaf pan. Align the dough logs so that they are next to each other and parallel, but with the layers of dough and filling visible and facing upwards. Gently press together one end of each half, and then lift the right half over the left half. Repeat this process, but this time, lift the left half over the right to create a simple, two-pronged plait. Repeat this process until there is no longer any dough left to braid — I think I was only able to cross the dough around 3 times or so since it's fairly thick but and short. Squeeze together the ends. Lightly spray the loaf pan with cooking spray. Use the parchment paper sling to transfer the dough braid into the loaf pan. Cover with plastic wrap and let rise at room temperature (between 70 to 80 degrees) for at least 1 to 1 1/2 hours. During this time, the cake will rise by about 10 to 20 percent. About 30 minutes into the rising process, prepare your oven and make the syrup. Center a rack and preheat to 375 (F). Combine 1 1/4 cups granulated sugar and 2/3 cup water in a small saucepan over medium heat. Whisk until the sugar is completely dissolved, and bring to a boil. Remove from heat and transfer to a wire rack to cool. Once the babka has finished its second rising, remove the plastic wrap from the loaf pan and transfer to the preheated oven. Bake for 30 minutes, before removing the babka from the oven and loosely covering the top of the loaf with a sheet of aluminum foil. Return to the oven and bake for an additional 15 to 20 minutes, or until a skewer inserted into the center of the babka comes out clean. Transfer to a wire rack and immediately use a pastry brush to brush the syrup (from the 8th step) across the babka. It's important to use all the syrup — it will seem like its too much, but I promise that it's not! 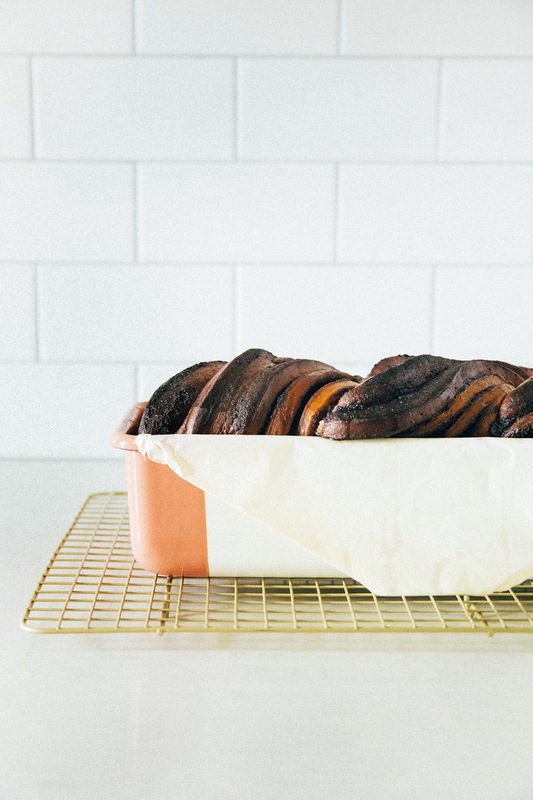 Allow the babka to cool in its pan for an additional 30 minutes, before using the parchment paper sling to remove it from its pan and onto the wire rack to cool completely. This looks so good!! I tried my hand at babka (never having had a real one) two Christmases ago. It was delicious but also stunted. I still haven't had the real thing, but I would like to try again for the proper height. Your success gives me confidence! haha.